Frasers Centrepoint Trust's 1QFY19 DPU was in line with our expectations at 24.9% of our full-year forecast. We expect the larger malls to continue delivering good performance. This should offset any weakness from the smaller malls going forward. Maintain ADD at an unchanged DDM-based Target Price of S$2.35. 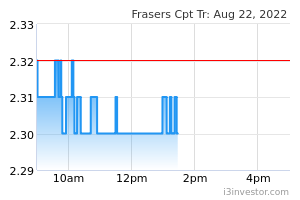 FRASERS CENTREPOINT TRUST (SGX:J69U)’s 1QFY19 DPU of S$3.02 cents was in line with our expectations at 24.9% of our full-year forecast. Revenue increased 2.9% to S$49.3m, while net property income (NPI) increased at a slower rate of 2.5% due to the higher marketing and carpark expenses incurred for Anchor Point (AP) whose carpark management commenced from 1 Dec 2017. This, coupled with the slightly higher borrowing cost from increased loans and management fees arising from the increase in NPI and total assets, resulted in a flattish net income, improving by 0.9% y-o-y to S$25.7m. DPU increased 0.7% y-o-y to 3.02 Scts. Larger malls continued to perform, with positive revenue and NPI growth. Changi City Point (CCP) reported the strongest y-o-y growth of 12.5%, thanks to the opening of Downtown Line since Oct 2017 which helped to improve shopper traffic and tenants’ sales. Despite the high revenue base, Northpoint City North Wing (NCNW) and Causeway Point (CP) continued to report encouraging growth of 4.5% and 1.1% respectively. Causeway Point registered strong +11.1% rental reversion on the renewal of a sizeable 20% of the mall’s NLA while Changi City Point and Northpoint City North Wing reported 1.9% and -1.3% rental reversion, respectively, on the renewal of a small ~4% of the malls’ NLA. Occupancy for these three malls remained high at 95-99%. As expected, the performance of the smaller malls remained relatively weak. Yew Tee Point (YTP), Anchor Point (AP) and Bedok Point (BP) reported y-o-y declines in NPI of 3.9%, 19% and 12.7% respectively. Occupancy for all three malls however improved on a y-o-y basis, indicating Frasers Centrepoint Trust has been focusing on filling up occupancy rather than higher rental which we think is the right strategy given that a highly occupied mall is more likely to attract higher traffic. While Yew Tee Point chalked a positive rental reversion of 5.4%, Bedok Point and Anchor Point reported negative rental reversion of 2.8% and 12.1% respectively. In 2019, Bedok Point, Yew Tee Point and Anchor Point has 21%, 16.7% and 38.7% of NLA up for renewal respectively. We maintain our ADD call on Frasers Centrepoint Trust with an unchanged Target Price. We believe Causeway Point, Northpoint City North Wing and Bedok Point, which together contributed 88.6% of 1QFY19 revenue, will continue to drive the performance of the trust, offsetting any weakness from the smaller malls. We continue to like Frasers Centrepoint Trust for its exposure to stable suburban malls. New acquisitions could catalyse the stock. Slower-than-expected rental reversion is a key downside risk to our call.